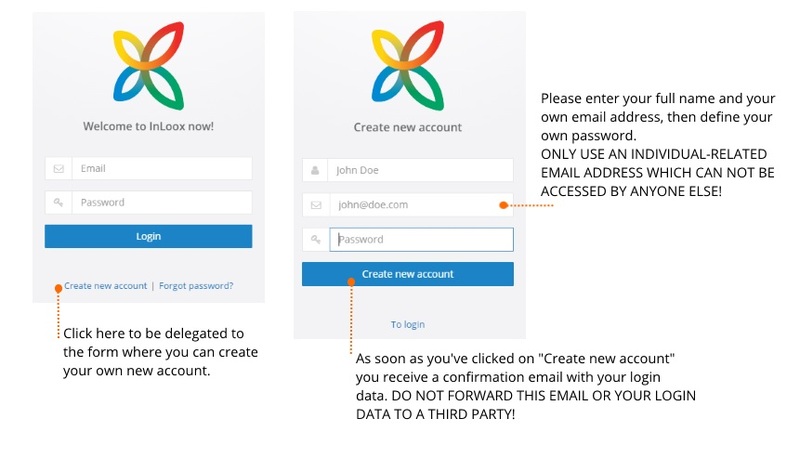 In the following we explain step-by-step how to create a new account for InLoox Web App. TIP We highly recommend updating your browser regularly to the latest version. This ensures best performance and that InLoox Web App is displayed properly. At the login-site, click on and then enter your full name, your own, individual-related email address and define your own password. Then click . You’ll immediately receive a confirmation email with your login data. Do not forward this email to a third party and do not share your InLoox Web App login data with anybody. PLEASE NOTE As the creator of your or your company’s InLoox Web App account you hold the administrator rights. This means that you alone have access to Options, which you access by clicking on your name in the Top Bar and selecting Options. This is where, in Options-Permissions-User Based, you may change the user-based permissions and e.g. transfer the administrator rights to another InLoox Web App user. In case you are using InLoox Web App in combination with InLoox PM for Outlook, please use your InLoox PM for Outlook login name and password to access InLoox Web App. You do not need to create a new account! All your data is synchronized and transferred from InLoox PM for Outlook to InLoox PM Web App. New Account | InLoox 10 Web App • Copyright 1999-2019 © InLoox, Inc. All rights reserved.